Part 2 in a series of posts on modern macroeconomics. Part 1 covered Keynesian economics, which dominated macroeconomic thinking for around thirty years following World War II. This post will deal with the reasons for the demise of the Keynesian consensus and introduce some of the key components of modern macro. Although Keynes had contemporary critics (most notably Hayek, if you haven’t seen the Keynes vs Hayek rap videos, stop reading now and go watch them here and here), these criticisms generally remained outside of the mainstream. 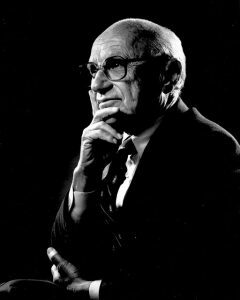 However, a more powerful challenger to Keynesian economics arose in the 1950s and 60s: Milton Friedman. Keynesian theory offered policymakers a set of tools that they could use to reduce unemployment. A key empirical and theoretical result was the existence of a “Phillips Curve,” which posited a tradeoff between unemployment and inflation. Keeping unemployment under control simply meant dealing with slightly higher levels of inflation. the level that would be ground out by the Walrasian system of general equilibrium equations, provided there is embedded in them the actual structural characteristics of the labour and commodity markets, including market imperfections, stochastic variability in demands and supplies, the costs of gathering information about job vacancies, and labor availabilities, the costs of mobility, and so on. If you don’t speak economics, the above essentially means that the rate of unemployment is determined by fundamental economic factors. Governments and central banks cannot do anything to influence this natural rate. Trying to exploit the Phillips curve relationship by increasing inflation would fail because eventually workers would simply factor the inflation into their decisions and restore the previous rate of employment at a higher level of prices. In the long run, printing money could do nothing to improve unemployment. Friedman’s theories couldn’t have come at a better time. In the 1970s, the United States experienced stagflation, high levels of both inflation and unemployment, an impossibility in the Keynesian models, but easily explained by Friedman’s theory. The first blow to Keynesian economics had been dealt. It would not survive the fight that was still to come. While Friedman may have provided the first blow, Robert Lucas landed the knockout punch on Keynesian economics. In a 1976 article, Lucas noted that standard economic models of the time assumed people were excessively naive. The rules that were supposed to describe their behavior were invariant to policy changes. Even when they knew about a policy in advance, they were unable to use the information to improve their forecasts, ensuring that those forecasts would be wrong. In Lucas’s words, they made “correctibly incorrect” forecasts. The Lucas Critique was devastating for the Keynesian modeling paradigm of the time. By estimating the relationships between aggregate variables based on past data, these models could not hope to capture the changes in individual actions that occur when the economy changes. In reality, people form their own theories about the economy (however simple they may be) and use those theories to form expectations about the future. Keynesian models could not allow for this possibility. At the heart of the problem with Keynesian models prior to the Lucas critique was their failure to incorporate individual decisions. In microeconomics, economic models almost always begin with a utility maximization problem for an individual or a profit maximization problem for a firm. Keynesian economics attempted to skip these features and jump straight to explaining output, inflation, and other aggregate features of the economy. The Lucas critique demonstrated that this strategy produced some dubious results. Think about a very simple economic story where a firm has to decide how much of a good to produce before they learn the price (such a model is called a “cobweb model”). Clearly, in order to make this decision a firm needs to form expectations about what the price will be (if they expect a higher price they will want to produce more). In most models before the 1960s, firms were assumed to form these expectations by looking at the past (called adaptive expectations). The problem with this assumption is that it creates predictable forecast errors. For example, assume that all firms simply believe that today’s price will be the same as yesterday. Then when the price yesterday was high, firms produce a lot, pushing down the price today. Then tomorrow, firms expect a low price so don’t produce very much, which pushes the price back up. A smart businessman would quickly realize that their expectations are always wrong and try to find a new way to predict future prices. Lucas took Muth’s idea and applied it to microfounded macroeconomic models. Agents in these new models were aware of the structure of the economy and therefore could not be fooled by policy changes. When a new policy is announced, these agents could anticipate the economic changes that would occur and adjust their own behavior. Microfoundations and rational expectations formed the foundation of a new kind of macroeconomics. Part 3 will discuss the development of Dynamic Stochastic General Equilibrium (DSGE) models, which have dominated macroeconomics for the last 30 years (and then in part 4 I promise I will actually get to what’s wrong with modern macro).